The Trump administration asked its head of federal personnel to step down over tensions regarding the future of his agency, according to several sources familiar with the decision. Jeff Pon, who until Friday served as director of the Office of Personnel Management, agreed to resign, but the decision came from the White House and was a surprise even to him, said multiple individuals with knowledge of the events who were granted anonymity to openly discuss private conversations. Multiple OPM officials on Friday said they were caught off guard by the announcement. Classifying Pon’s departure as a resignation cleared up potential trouble with the law governing federal vacancies, and President Trump has named Office of Management and Budget Deputy Director for Management Margaret Weichert as acting director. The move comes as the Trump administration, through an effort spearheaded by Weichert, is seeking to merge many OPM functions with the General Services Administration while folding its policymaking responsibilities into the Executive Office of the President at the White House. Pon was demonstrating resistance to at least part of that plan, several sources said. In July, Pon told Government Executive he was still considering whether moving OPM to a component housed within the White House was a worthwhile endeavor. “Everyone at OPM was surprised, including Jeff,” said a source familiar with the discussions of Pon’s resignation. 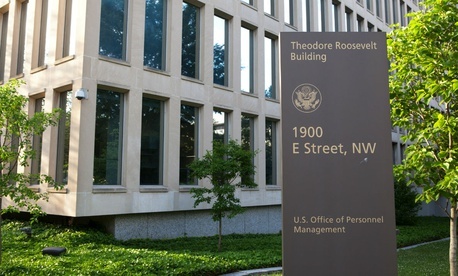 Other members of the administration had accused Pon of “putting up roadblocks” to the OPM-GSA merger, the source said, despite both agencies already moving forward with those plans. “I don’t think he was he was on board with the administration’s agenda,” said another source aware of the decision behind Pon’s departure. “I think they want someone who was much more compliant in that position. And they got her.” The individual added that Pon had concluded the OPM reorganization was ill-advised and that he had little input into the proposal. Multiple individuals described Pon as defensive of OPM as an institution and unsure of the decision to strip the agency of its independence. With Weichert in charge, sources said they now expect the administration to accelerate its plan to shrink the agency’s responsibilities. Weichert has defended the plan as an elevation of the agency, citing the proximity the director would have to the White House. By temporarily leading the agency—and one source said the administration is already considering replacements—it appears Weichert has, at least for now, accomplished that goal. The former official lamented that OPM is once again subject to tumult and uncertainty. Pon was the first Senate-confirmed director at the agency since Katherine Archuleta resigned in 2015. One of the sources expected to see morale plummet and attrition increase at OPM. That individual was surprised that Pon was not provided with a “soft landing.” Multiple individuals confirmed that senior aides to Pon were also removed from OPM, including his chief of staff and his confidential assistant. “This was pretty brutal,” the source said. OPM declined to elaborate on the circumstances surrounding Pon’s departure, referring questions to the White House. A White House official also declined to answer questions, aside from noting that Pon had resigned. As of Tuesday, OPM had resumed business as usual and made Pon’s departure official on the president’s preferred mode of communication: Twitter.